Birds are probably one of the most common types of wild animals Canadians see on a regular basis. In 2013, many Canadian households (25%) had bird feeders and bird houses in their yards, and 9% of households bought products such as bird identification books or binoculars, or took trips to watch birds. Households in Prince Edward Island (44%), Nova Scotia (39%) and New Brunswick (36%) were the most likely to have made purchases to feed or shelter birds on their property, while households in Quebec were the least likely (20%). British Columbians were most likely to have bought bird books, binoculars or travelled to watch birds (11%), while households in Newfoundland and Labrador were the least likely (6%). In general, households in census metropolitan areas (CMAs), which are large urban areas, were less likely to have made purchases to feed or shelter birds on their property than were non-CMA households (20% compared to 36%). Only households in the CMAs of Kelowna (41%)Note E, Barrie (38%), Saint John (37%), and Victoria (37%) were more likely to do this compared to non-CMA households. 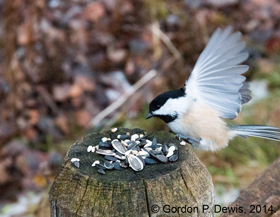 With the exception of households composed solely of members between the ages of 25 and 44, Canadian households in different age groups made purchases to feed or shelter birds on their property at similar rates (between 24% and 29%). Households composed only of people between the ages of 25 and 44 were significantly less likely to have made these purchases, with just 12% doing so. Feeding and sheltering birds, and purchases and travel to watch birds are discretionary spending activities, so it is not surprising to see that as total annual household income increased, so too did the participation in these activities. Fifteen percent of low-income householdsNote 1 spent money to feed and shelter birds on their property compared to 30% of high-income households.Note 2 Households that had total annual incomes of $100,000 to $149,999 were most likely to have made these purchases (31%). Similarly, the probability that a household had made purchases to watch birds increased based on its total annual income. In 2013, only 6%Note E of low-income households made these purchases compared to 13% of high-income households. Households in single-detached dwellings (34%) were twice as likely as households in most other types of dwellings (e.g. duplexes (13%), row or terrace homes (18%), or low-rise apartments (8%)) to have made purchases to feed or shelter birds on their properties. Twenty-two percent of households that lived in doubles (side by side) made such purchases. Purchases to watch birds, including bird watching trips, were more likely to be made by households in single-detached dwellings than most other types of dwellings. The Households and the Environment Survey asks Canadian households about their activities and behaviours with respect to the environment. It covers a wide variety of topics including water and energy consumption and conservation, hazardous products used in the home, and the household's interactions with nature. Data from the survey are used by governments to guide policies and programs, by researchers to learn more about Canadians and by individuals to see how they compare to the rest of the country. The target population of the 2013 Households and the Environment Survey consisted of households in Canada, excluding households located in Yukon, Northwest Territories and Nunavut, households located on Indian Reserves or Crown lands, and households consisting entirely of full-time members of the Canadian Armed Forces. Institutions and households in certain remote regions were also excluded. Households that had a total annual income of less than $20,000. Households that had a total annual income of $150,000 or more.